Catasauqua is a small town located next to both Allentown and Bethlehem, PA.
Exit Fullerton St. Go north on Fullerton, turn right on Pine St, cross the Pine Bridge, and go up Pine St. Turn left on 5th St and continue to the Church. 8:40 AM Hours; 9:00 AM Divine Liturgy. For a complete list of upcoming services, please visit the Monthly Calendar on the parish website. FOR FURTHER INFORMATION call the church at 610-443-0268 or email at holytrinityoca@yahoo.com. Please join us! Around 1891 an influx of Russian speaking people from Russia, Austria-Hungary, Poland and other Slavic speaking Europeans began seeking to settle in Catasauqua and the surrounding area because of employment opportunities available in the cement quarries, steel mills, fabric works and shoe factory. The available fertile farmland made this a desirable location for many people, and the rolling hills were reminiscent of the Carpatho-Russian lands. All of these things began sowing the seed for Holy Trinity Orthodox Catholic Church. In 1899 the lime cornerstone was laid and blessed by Father Alexis Tovt (Toth), who later was proclaimed St. Alexis of Wilkes-Barre. On November 22, 1903, the church was consecrated by the Most Reverend Archbishop Tikhon (later Patriarch of all Russia and now St. Tikhon of Moscow), ruling primate of the Russian Orthodox Greek Catholic Church in America. On October 20, 1907, the first rectory was blessed by Archbishop Platon. In 1918 the Icon of the Mother of Pochaev, one of 300 world wide, was purchased. The riza was restored in 2008. It hangs over the Royal Doors of the Iconostas. The Feast Day of her commemoration is July 23 (also on Friday of Bright Week and September 8). Over the years, Holy Trinity Church planted seeds of the One, True Faith throughout the Lehigh Valley of Pennsylvania. 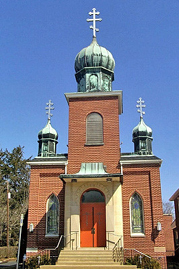 St. Nicholas Russian Orthodox Church in Bethlehem, PA is the fruit of one of those seeds. Following in the footsteps of our forefathers in the Faith, Holy Trinity continues to plant seeds of the Faith in our local and surrounding communities in the Lehigh Valley. All are welcome! Please come and worship with us!